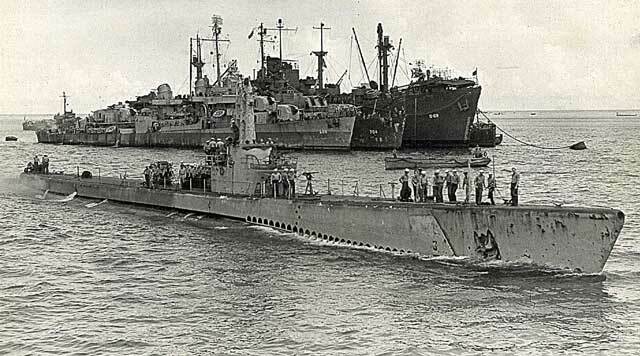 Welcome to the USS ICEFISH, honoring one of World War II's fleet submarines. during its five war patrols in the Pacific Ocean in 1944 and 1945.
achieved unrivaled accomplishments under overwhelming circumstances. (including at least 1,178 merchant ships and 214 warships) totaling more than 5.3 million tons. – 22% percent of the submarine fleet – were lost during hostilities. Twenty-two were awarded Presidential Unit Citations. The USS Icefish and its crew played a part in this struggle. following its fifth and final war patrol in August, 1945.
and he remains one of my heroes. Thanks, pop. He is now on eternal patrol with his fellow crew mates.